Viton™ or Dyneon™ based fluoroelastomer caulks and sealants provide excellent resistance against sulfuric acid, hydrochloric acid, nitric acid, gasoline, diesel fuel, jet fuel, crude oil, and can withstand temperature extremes of -40 to +400 degrees Fahrenheit (-40 to +205 degrees Celsius). Pelseal® 2012: 2-part, black sealant/caulk. Highly viscous material suitable for vertical and overhead applications. Pelseal® 2077: 1-part, black sealant/caulk. Material supplied in re-sealing caulk cartridges. Viscous but self-leveling material suitable for horizontal applications. Pelseal® 2078: Zero-VOC, 1-part, black sealant/caulk. Material supplied in re-sealing caulk cartridges. Viscous but self-leveling material suitable for horizontal applications. Pelseal® 2112: 2-part, black sealant/caulk. Viscous but self-leveling material suitable for horizontal applications. Pelseal® 2531: 1-part, black sealant/caulk. Viscous material suitable for horizontal applications. Supplied in re-sealing caulk cartridges. Pelseal® 2690: Zero-VOC, 1-part, black caulk. Non-sag for horizontal and vertical applications. Pelseal® 3159: 2-part, gray sealant. 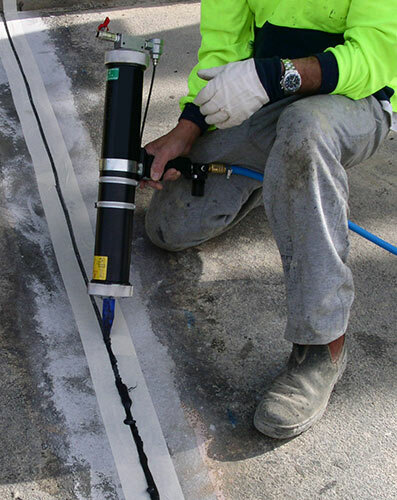 Low viscosity, self leveling for horizontal applications. Pelseal® 3169: 2-part, gray sealant. Trowel grade for vertical applications. Pelseal® 6080: 2-part, charcoal-gray sealant. Trowel grade for horizontal and some vertical applications. Pelseal® 6200: 2-part, gray sealant. Low viscosity and more flexible, self leveling for horizontal applications. ACCELERATOR #4: Curing agent which is added to the 2-part sealants/caulks prior to application.